CITY HALL – Only three of six Arcata City Council aspirants will appear on the November ballot, and they already hold office. Incumbent Councilmembers Shane Brinton, Michael Winkler and Susan Ornelas all qualified for candidacy by supplying nominating petitions bearing the signatures of at least 20 registered Arcata voters by the Aug. 10 deadline. All three non-incumbents who had filed papers – Jolian Kangas, Valerie Rose-Campbell and Mark Sailors – did not meet the 20-signature threshold, and will not be on the ballot. The three may still run as write-in candidates, but must meet the same requirements for ballots cast in their name to count. They may again take out papers on Sept. 10, then submit petitions by Oct. 23. Just 11 of the 27 signatures Kangas supplied were valid. Rose-Campbell had 16 of 30 verified. Sailors scored 15 out of 26. 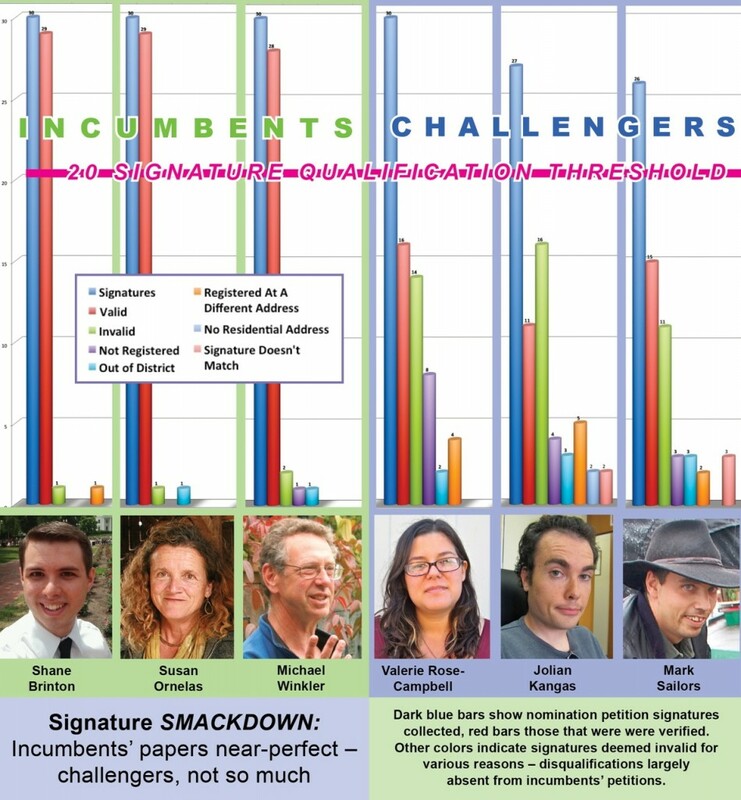 The challengers’ petitions were riddled with disqualifying errors. Kangas earned the lowest ration of valid-to-invalid signatures at just 40.7 percent. Five of his signatories were registered at different addresses, four weren’t registered to vote, three were registered outside Arcata, two gave an invalid address and two signatures didn’t match those on file for the voter. One of the signers listed an address on Jacoby Creek Road, well outside Arcata city limits. Salors managed a 57.6 percent validation rate, but was five short of the required 20 signatures. Three of his signers weren’t registered to vote, three were registered outside Arcata, three had non-matching signatures and two gave bad addresses. At 53.3 percent valid, Rose-Campbell managed just 16 countable signatures. Eight of hers were from people who hadn’t registered to vote, four who registered at a different address than the one given and two from non-Arcata voters. Deputy City Clerk Bridget Dory said election officials “always give the benefit of the doubt” when it comes to signature matches. “It has to be way off for them to say it doesn’t match,” Dory said. She said those whose signatures are disqualified for bad addresses are routinely mailed new voter registration forms so they can update their status. Sailors didn’t it to review the petitions to raise allegations of wrongdoing. He was quoted in the North Coast Journal voicing suspicions of chicanery in the signature verification process. But two days later, in a comment on the Eye’s website, he doubled down on his orginal charge, alleging fraud by the county’s Elections Division in the verification of nomination petitions. Sailors said he was considering running as a write-in candidate for the good of the community. “It might be a more difficult race to win as a write in, but at least then we can get an honest discussion of the issues in some sort of candidate forum or debate,” he said. Rose-Campbell vowed to press on with a write-in candidacy. Candidate Jolian Kangas didn’t respond to a message sent via Facebook, which he had listed as a contact in a campaign flyer. At last week’s City Council meeting, Councilmember Susan Ornelas said she was “in shock” over the startling turn of events, which left the three incumbent candidates with no opposition on the November ballot. By week’s end, she was grasping for an explanation, and credited a mixture of lack of preparation by the challengers and general satisfaction with incumbent officeholders. “I think it really was just a mix of being unprepared to challenge, and a general ‘like’ of how things are being managed right now,” Ornelas said. As to the collapse of the opposition, Winkler placed the blame squarely on the would-be challengers. “I can’t imagine that anyone has much of a commitment to running if they don’t go to the trouble of making sure they have enough signatures and doing it early enough to be able to get more,” he said. He’s referring to a tactic used effectively by Councilmember Shane Brinton and former council candidate Geronimo Garcia – turning the nominating petitions in early enough so that if there aren’t enough valid signatures, more can be obtained to ensure ballot placement for the candidate. That wasn’t possible for Kangas, Rose-Campbell and Sailors, as they turned in their petitions too late. Kangas and Sailors were still soliciting signatures in the lobby of City Hall mere minutes before the Aug. 10, 5 p.m. deadline for turning in petitions. They got the bad news about their petitions’ insufficiency after it was too late to gather more signatures. Winkler said he would use some of the the energy he would have put into his re-election campaign into promoting Measure I, the proposed tax on excessive electricity use aimed at abating illegal cannabis grow houses. Brinton also said he would make a push to get Measure I passed. This entry was posted on Thursday, August 23rd, 2012 at 9:02 am	and is filed under News. You can follow any responses to this entry through the RSS 2.0 feed.